A quick glance at a mature planting bed and the identity of the numerous layers of plant materials might be overlooked at first sight. In our hurry-up culture we have a tendency to instantly take note of the overall view with our mind's eye; summing it up with our judgment of approval ... or not. Then we move on. Just for a moment what if we linger right here? I'm struck by the complexity that any one segment from the garden represents. Each plant tells a story. Each part of the garden is brimming with its own history regarding the planning, toil, and nurturing it required to get to this point. In a working garden there is a continual ebb and flow of change. Additions and removal, transplants, divisions, and seeds make up the whole and the parts. Nothing remains stagnant as a garden is where life is abounds. So if we were to take apart the layers of one scene i.e., the first photo we would see towering scrub oak trees clumped together in their own mini-grove creating the foundation for a naturalistic garden scene. 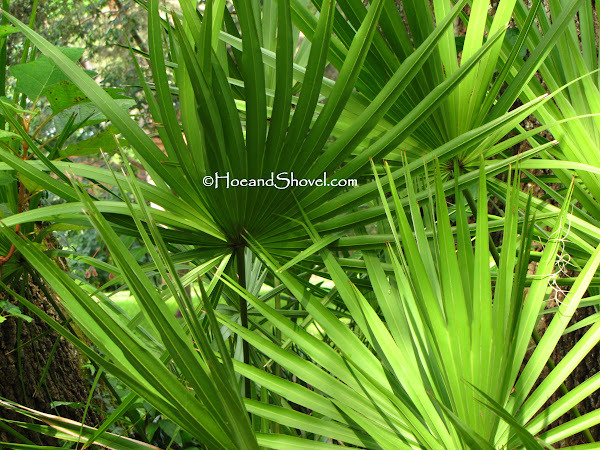 At their base saw palmetto shrubs (serenoa repens) randomly placed evoke feelings of a native Florida oak hammock. These were the starts. The beginnings. Gradually the rest has been added. There are a few native Scrub palms (Sabal etonia) dotted throughout this mixed bed along with Southern Indica Azaleas. Mammoth bulbs of 'Red Flash' caladiums peek over the border edged by variegated aztec grass. Also 'Miss Muffett' caladiums clump here and there to blend with all the reds and greens for summer brightness. 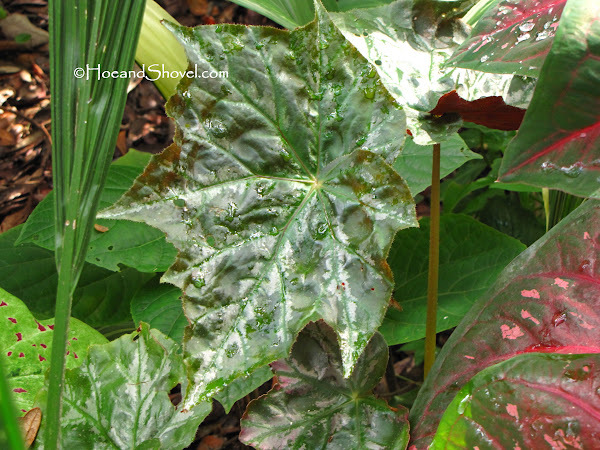 The large palmate leaves on the Jatropha podagrica (better viewed in second photo) add lushness beside the caladiums. 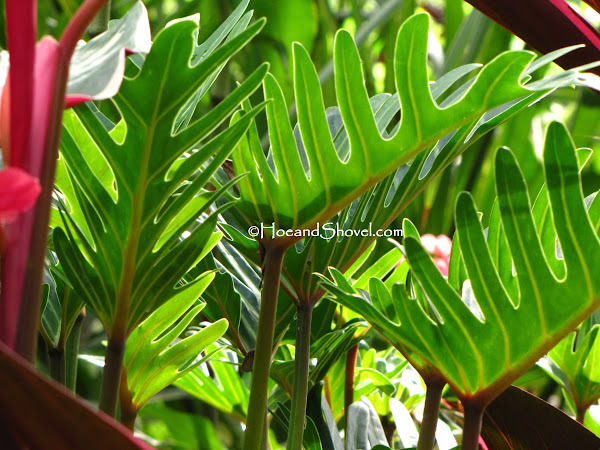 The medium-height layer includes perennial Xanadu Philodendron. 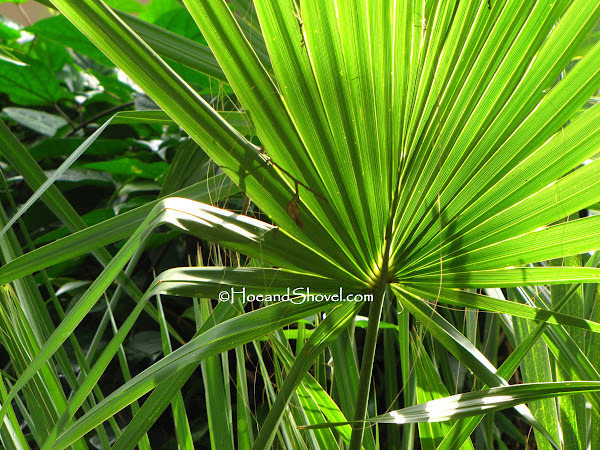 Utilized as a houseplant in most zones but here we put them directly in the ground and mix them up with our Florida native and Florida-Friendly selections. 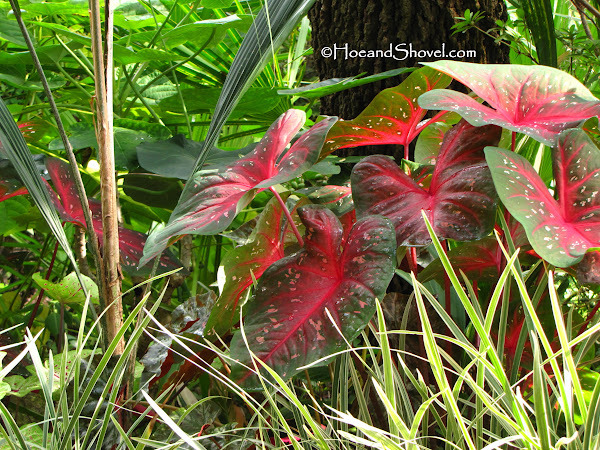 Tip: plant caladium bulbs between xanadu and aztec grass and the branches on the xanadu help to hold up the caladiums. The aztec grass wedges them in for longer enjoyment at the end of their season when they tend to droop . 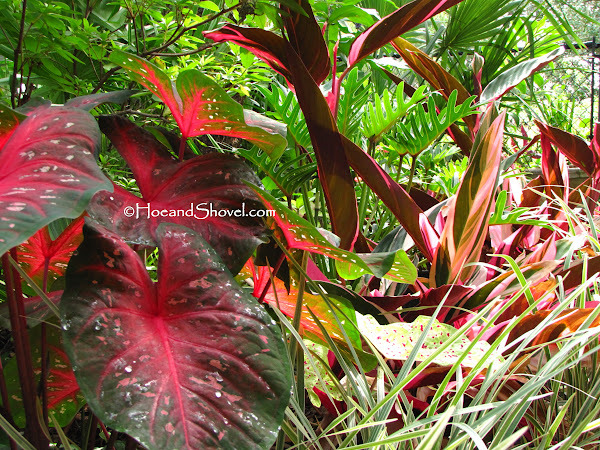 Stromanthe sanguinea 'Trio-star' cast a colorful echo of the 'red flash' caladiums. Its foliage is watercolored in green, white, and brilliant red. This one is tender to frost and needs some extra protection during those few chilly nights of winter. 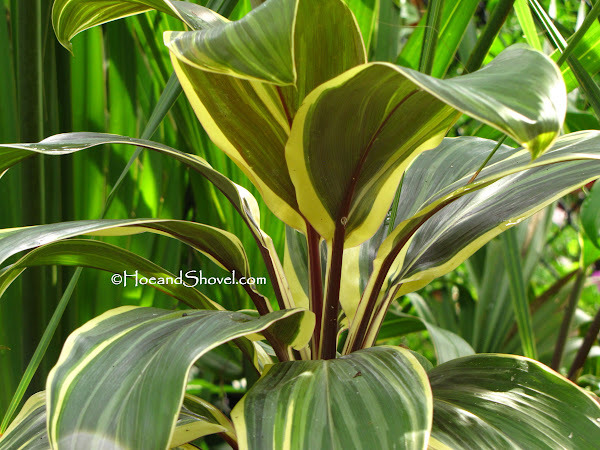 Filling a pocket between palmettos are a few Cordyline 'Chocolate Queen' plants that, like so many of my choices, depend on variations of foliage coloration for their spark of tropical beauty. What catches my interest most is the unseen. 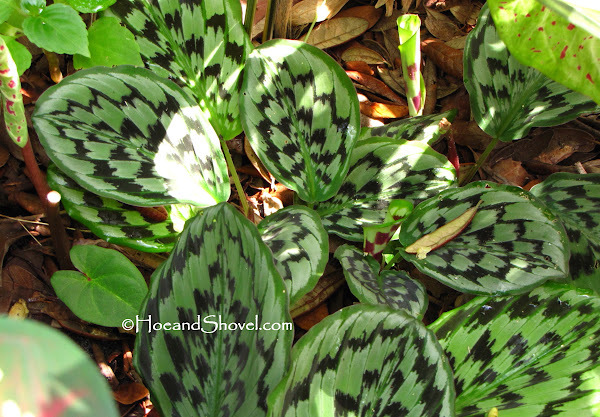 It requires a detailed observer to take an extra moment for a close up view to notice the ground covers. Behind the aztec grass and on the floor level you'll find begonias. 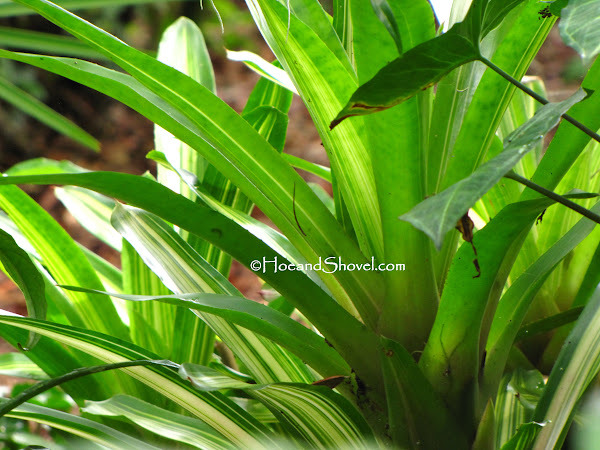 Bromeliads cover parts of the ground areas. Begonias and broms divided and transplanted from other parts of the garden. And one of my very favorite covers for those otherwise empty ground spots is the 'Satin Checks’ peacock ginger, Kaempferia elegans. But you could easily miss them altogether unless you took the time to lean over the plants in plain view to see the hidden treasures below them. Layers and layers! Full of surprises and joy! These garden layers of yours are delicious. I drool every time I see those big leafed caladiums. I love that last plant too. I am not familiar with it. It reminds me of a house plant I used to have. I don't know anything but the common name for it 'praying hands'. I know I don't comment much, but I do read all your entries. I'm in awe of the beauty of nature and how you manipulate the garden to highlight that beauty. Work of art. Your opening statement is spot-on! You would make a great painter with your discussion of layering! 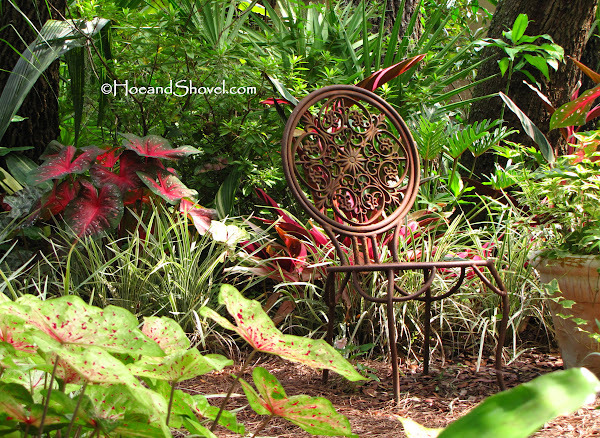 Your garden art is lovely, xanadu and caladiums are my favs, will try them tucked together. Thx for continually inspiring me! Another wonderful, informative and colorful post Meems. I'm always inspired visiting here. A variety of plants really do make the garden far more interesting and fun to create. And, all your lovelies look so happy together. Those philodendrens look huge! So tropical and at home in your lush garden. Love the contrast on that last ginger! Enjoyed viewing the layers in this area of your garden. Breaking them down really does help me see aspects I've missed before. Peeking over and through to those groundcovers was fun. I had no idea they were there. Great explanation of how to build the landscape. It never fails that I learn something every time I read your blog. Next Spring or summer I shall plant my caladiums with some grass type plant so it will help keep it from flopping. Great tip----never thought of it before. Thanks. I think you're referring to 'prayer plant' (maranta) ... they DO indeed look similar to the peacock gingers. I LOVE to paint... I've decided to stick with gardening. Xanadu hasn't liked our last 3 cold winters but where you are they are fool-proof. The chair qualifies as a layer. Focal points are just as important as the plants... that chair is one of my most cherished pieces. Thanks. And I'm always blessed by your visits. Thank you. 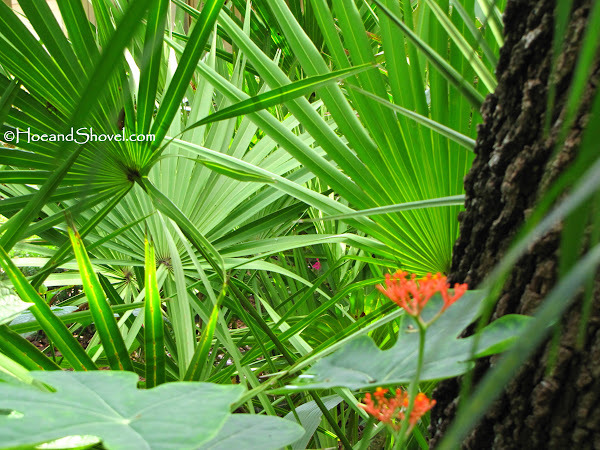 This is great time of year for Florida gardeners. Our plants are thriving in full glory of summer. The xanadu is not too huge... only about 2 feet tall it makes a nice middle of the border plant. It always amazes me how plants can fit into one area when placed correctly. I wish that stromanthe wasn't so cold tender... I'd plant lots more of it. That warms my heart... so glad you walk away with something helpful... that's what this is all about. Happy gardening. Love how you show the layers! Florida foliage is so beautiful and love what you've done with it.